by Anthony M Johnson PhD - including a foreword by Sir Peter Scott is published by the Captain Scott Society, Cardiff. Copies are available from major bookshops in Cardiff or directly, by mail order, from the Literary Secretary, c/o The Captain Scott Society, United Services Mess, Westminster Chambers, Wharton Street, Cardiff at £5-95 each. For postage and packing add £0-55p for the UK or £2-00 for international. Payment by crossed cheque (UK only) or International Money Order. Dr Johnson's book chronicles the relationship that developed between the people of the City of Cardiff, together with its prosperous docks community, and the British Antarctic Expedition 1910 led by Robert Falcon Scott. Its span extends from the first announcement of intent in 1909 to beyond the return of the Expedition to Cardiff in 1913. It records the circumstances of the failure of the City to provide a fitting memorial to the men who died seeking to achieve that Antarctic goal. WHALER, SEALER AND POLAR EXPLORATION SHIP. with a foreword by Her Royal Highness The Princess Royal. Michael C. Tarver. 2006. 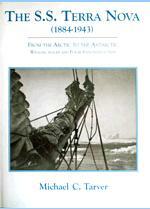 Brixham, Devon: Pendragon Maritime Publications. 256 p, illustrated, hard cover. ISBN 0-9552208-0-7. £30.00. Terra Nova, a large and powerful steam whaler was seconded from the seal fishery in Newfoundland as relief ship for the British National Antarctic Expedition, 1901-1904, and the United States Fiala-Ziegler Arctic Expedition, 1903-1905. Her most famous role was for three years as the expedition ship for the British Antarctic Expedition, 1910-1913, led by Captain Robert Falcon Scott, RN.